Megan and I are staying at the Cherry Valley Lodge in Newark, Ohio, this weekend. We just had to get away from the city. Well, this is not completely true, since Megan is here attending the Ohio Certified Nurse Midwife Conference. With her at the conference all day long, I had two choices-- pay $15.00 to spend a day at the CoCo Key indoor water park, OR go birding at Black Hand Gorge and Dillon State Park. This was not a difficult decision. 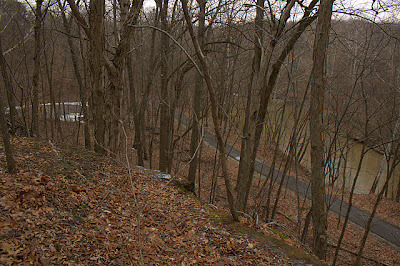 Black Hand Gorge State Nature Preserve lies at the foot of a tiny little town called Toboso. Toboso is almost ten miles due east of Newark, itself about 45 miles east of Columbus. What this means is that here, I am in a completely different ecoregion. We're talking unglaciated Ohio. Unglaciated Appalachian plateau. Acidic soils, sandstone bedrock, and hills. 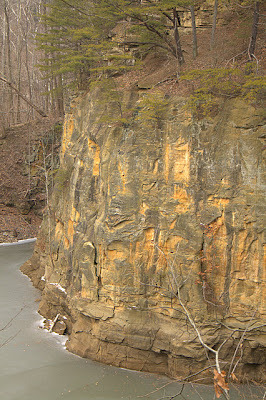 The centerpiece of Blackhand is the Licking River, which has cut a path through the hard, massive, coarse grained orange-yellow rock called Blackhand Sandstone. That's right, this sandstone that occurs throughout eastern Ohio was named after this gorge. But why blackhand? A large and prominent Native American petroglyph once existed on a large natural sandstone bluff in the gorge overlooking the river. Unfortunately, the glyph was destroyed during construction of a canal in the 1820's. Some of the canal's infrastructure exists today, but there is no sign of the historic glyph. Yet there is plenty of its namesake sandstone. Think sandstone, think river gorge, think abandoned nineteenth century quarries, and think of a railroad that once hauled stone the across Ohio, and you have Black Hand Gorge State Nature Preserve. I park Megan's yellow Volvo v40 at the trail head. The defunct railroad is now a four mile long bike trail and the quarries are long abandoned and grown up with natural vegetation. A typical gray winter day. Cold, about 30 degrees, no wind, and no shadows. Very quiet. A few cars in the parking lot. I open the trunk, reach for my camera and slide on the telephoto lens. What birds will I see? I began by pishing near an old open quarry now filled with water and choked with buttonbush shrubs. Carolina chickadees fly in almost instantaneously, appearing from hiding places in the wetland and adjacent oak woods. Within a few minutes, I have six. Then comes a lone tufted titmouse, and finally, a curious song sparrow. I keep listening, watching, and panning the horizon with my bins. 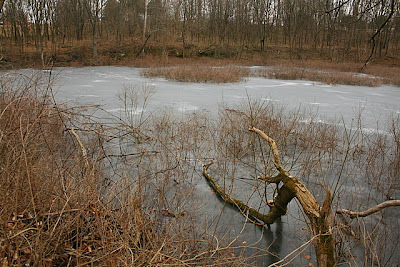 Within sight, I have several interesting and diverse habitats- river and floodplain, buttonbush wetland, and dry upland woods. A flash of red down in a buttonbush. The racket of the chickadees catch a male northern cardinal's attention. Sure enough, a loud repetitive squawking from across the river, only to be answered further downstream. The call of two conversing pileated woodpeckers! I manage to get a pretty crappy shot of a beautiful male. What else? Rattle, a flash of blue and white, zipping down the ice free river, and a male belted kingfisher is on my list for the day. Not too bad! I move on, breathless from pishing, no longer worthy of the chickadees attention. I keep walking, photographing the gorge, the old canal infrastructure, and the outcropping where the black hand was said to have been. I walk through the old rail road cut through the sandstone. It looks as if this were a tunnel with no roof. I finally arrive at an opening across the river created by the active railroad line that still runs through the gorge. A twitch in a box-elder. I reach for the bins, see a little olive bird with a gorgeous yellow patch on its round head. A yellow-crowned kinglet. A hear a Robin, but it is different. Flash, bins to the eyes, up to the tree, and sure enough I have a thrush. Robin sized, white breasted, dark brown streaks. A hermit thrush perhaps? I snap a few shots to compare with the field guides when I get back. It is cold! Still cloudy, no wind. I continue down the trail after picking up the white-breasted nuthatch, red bellied woodpecker, northern flicker, and downy woodpecker. Several patches of sandstone to my left are very icy. 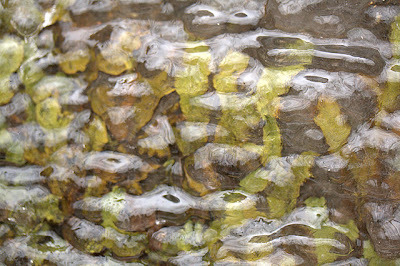 So icy that the sedges, liverworts, and Christmas ferns have been enveloped in an ice glaze. I slap on the macro lens and shoot away. Maybe I can use these shots for my photography class? On my way back I take the quarry rim trail, and I think I hear something. I dismiss the sound. I shouldn't have. I should have put back on the telephoto lens! 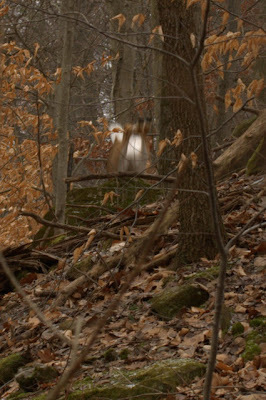 Four white tailed dear bound up ahead of me. The quarry rim trail is high and dry. The trail is flat and winds through Virginia pine above and ground-pine (Disphasiastrum digitatum) below, both signs of sterile, dry soil. Towards the edges of the old quarry grow species that are like things damp and moist-American beach, Canada hemlock, and yellow birch. 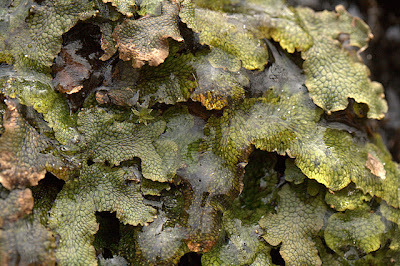 In between the super dry and sheltered cliffs grow red oak, white oak, and black cherry. Still cloudy, still gray, still no shadows. Very few birds, so my attention turns back to plants. I see a winter rosette of a Panicum grass, of which species I do not know. 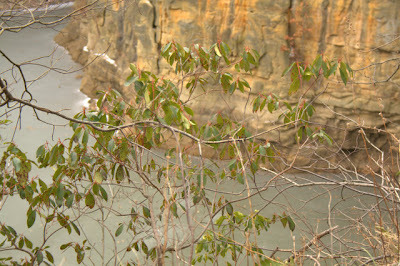 Flowering dogwood and mountain laurel also pop up along the rims of the old quarries. Finally, an old Virginia pine that has just been massacred by yellow bellied sapsuckers. It is cold, it is gray, and I have to pee. On my adventure, I came across a few brave hikers. Two people mentioned bald eagles. The first visitor asked me if I had see any eagles, and he said that he saw one around the river about a month ago. On my way out, another man walking his dog asked me if I knew "where the eagle nest was at". Hmm. Rumors? Truth? The preserve is over 900 acres and there are plenty of hidden places where a pair of eagles would feel comfortable. I think to myself that I'll have to follow up on this. But ultimately, I couldn't help but think I was going to see an eagle on this day, and I had one more place on my birding list, Dillon Lake State Park. Tom: What a detailed hike! I like how you included soil and stone types. All those birds are such a treat, can't wait to see pictures! Well, Tom, you have posted an interesting one today. I enjoyed reading it. I am also glad you got acquainted me with as you are doing some of what I have done for the past forty-some years. I like this blog. I had a website for many years about backyard wildlife but no long have it up. That was back in the days when the National Wildlife Federation still had their group up on their servers and a bunch of us got acquainted. My backyard wildlife registration number is 6769 and the last time I heard it was upwards of 50,000 as I recall. Anyway, I only have the blog you visited and mybirdsblog.blogspot.com/ I add to that daily as I do the brookvilledailyphoto.blogspot.com blog. The pictures are now up, enjoy. Don't forget, part two is coming. It was a busy day, wasn't it? It sounds fantastic to have so much wildlife around you on the hike. Here in New Zealand we don't seem to meet such a variety on a typical bush-walk. Awesome photos as well. What a marvelous post and fantastic photos. Jeff and I would love staying at Dillon Lake State Park. :D How beautiful. One of my daughters is an RN, the other a supervisor of medical records in a hospital. That's cool your wife is in to midwifing. We have three bald eagles that we have seen where we live. Sometimes I see a long shadow moving on the ground when I'm in the house and run outside to catch a view. And make sure the cats are all right. Although it looks very chilly to this Californian, that's a beautiful area, and you saw some great birds! That sure looks like a Hermit Thrush to me, BTW. What a chilly day! It looks freezing out! Thank You, It was a pretty cool place. Not the highest ecologically intact state in Ohio, but cool stuff none the less. Thank You. My personal favorite is the water droplets. I got really lucky on that one. Kev- Interesting. I've never been to New Zealand but I spent three months in Australia in 1999 and that place has some cool animals and plants! Megan is getting her PhD in nursing so she'll teach nurses. She's awesome. I have a personal health care professional in my house all the time. Adam- You bet it is cold. I was watching the SAG pre-show awards and saw all of these beautiful women in dresses cut down to their belly buttons complaining about the cold So Cal weather. Vanessa Williams, try wearing that dress here in Ohio! Sounds like you had a full and fun day birding, hiking and exploring. Much better than CoCo Key I'm sure. Congratulations on seeing the bald eagle at Dillon Lake.